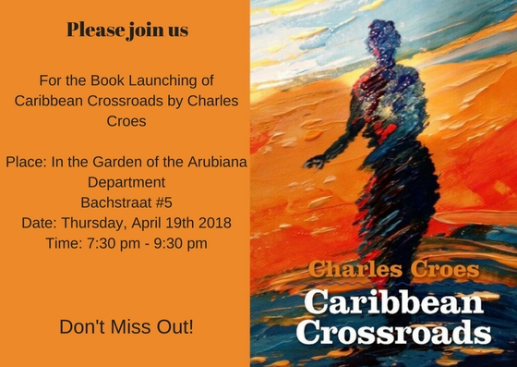 This Thursday evening you are invited to the Book launch of ‘Caribbean Crossroads’ by Charles Croes which takes places in the garden of department Arubiana/Caribiana of Biblioteca Nacional Aruba at Bachstraat 5. Doors open at 19:30 PM. ‘Caribbean Crossroads’ is a Caribbean novel about the journey of a young boy named Chen from the outback’s of Venezuela. A journey filled with action, conflict, pain, mythical mysteries and finally love. Experience a life of hidden messages and harsh truths. Caribbean Crossroads moves from a dusty obscurity to the splendor of Aruba. 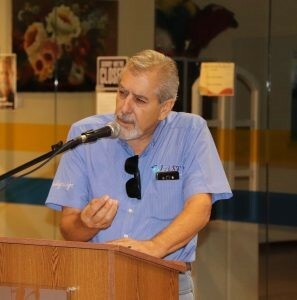 Charles Croes is the author of ‘Caribbean Crossroads. Charles August Croes, II was born in New York in 1945 to parents who emigrated from Aruba. When his family moved back to Aruba during his early childhood, he never doubted this small island would be “his last stop.” Charles’ work is satirical, captivating, intimate, and fun to read. ‘Caribbean Crossroads is a publication of LM publishers and Editorial Charuba. this is a story packed with adventure, mystery, grief, and heartfelt love. The author has a gift with words and so eloquently tells the heartwarming saga of a man’s quest to secure a better life for his family and future generations. Mr. Charles Croes exceptional writing skills allow the reader to feel the love, the tenacity, and the vulnerability of the main character throughout this difficult journey. All of us, with lineage to other lands then where we reside today, could feel what our ancestors must have endured when they left their homeland to better themselves in a new world. This book will keep the reader’s interest from page one until the very end leaving you eagerly anticipating what the author might have in store for us next. Thank you, Mr. Croes for sharing your talent with the world!